We’d love your help. Let us know what’s wrong with this preview of The Bones & Breath by L.R. Heartsong. In "The Bones and Breath," Heartsong asserts that we each have an essential gift to bring to the world and through actively embodying the soul--primarily via the body and our expanded, physical senses--we undertake a profound, transpersonal journey; one that serves humanity and the Earth at a crucial phase of our collective evolution. Our life task is not to transcend the In "The Bones and Breath," Heartsong asserts that we each have an essential gift to bring to the world and through actively embodying the soul--primarily via the body and our expanded, physical senses--we undertake a profound, transpersonal journey; one that serves humanity and the Earth at a crucial phase of our collective evolution. Our life task is not to transcend the body but to become fully human by descending into the bones and breath, to there discover the gift our soul has to offer to the 'more-than-human' world. Heartsong seeks to bring men out of their heads and down into the bodysoul, there to discover their personal authenticity as a wild soul. To ask other readers questions about The Bones & Breath, please sign up. This book is not specifically for men. This book is for all souls in search of themselves, of something more than simply existing. The Bones & Breath is for all humans fully human, yet spiritual, or seeking to simply be. 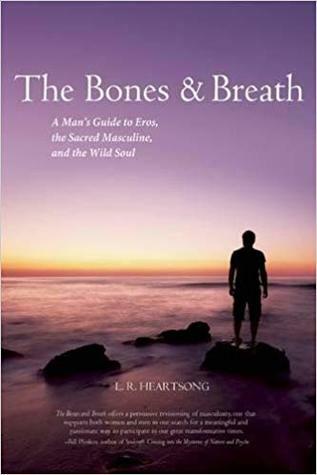 My connecti L. R. Heartsong, artist, writer, author, French trained chef, light worker, shaman, and utterly wild soul, published a profound 223 page softcover volume, The Bones & Breath, A Man's Guide to Eros, the Sacred Masculine and the Wild Soul, via White Cloud Press. This book is not specifically for men. This book is for all souls in search of themselves, of something more than simply existing. The Bones & Breath is for all humans fully human, yet spiritual, or seeking to simply be. My connection to this book and the author changed my life, solidified my thoughts, enhanced my state of existence and caused me to realize that I am not alone. This volume will touch you deeply, if you allow it to, if are willing to explore this grand stage and promise to stay in a state of absolute awe and wonderment. This book holds your hand, yet guides you. For example, if one wishes to face the dark within self, at the end of chapter 4, Myth, Shadow, and Light, the author suggests embodying soul skills to explore your inner darkness. The suggestions are merely just that, questions that you can choose to ask yourself and choose to answer. If one wishes to embark, the questions may bring the hidden, to light. Written from pure stream of consciousness, The Bones & Breath speaks to the soul. Every chapter involves new ideas, allowing my heart to open wider, my mind to expand, my dark side to emerge and my light to shine brighter than a beacon. This is not only a book everyone needs to own, but also a book ripe with extensive knowledge of the human experience and all it encompasses. L.R. Heartsong is “a healer who writes.” A bodyworker and counselor for more than twenty-five years, he fuses eco-depth psychology, soul-based coaching, shamanic work, and spiritual guidance. He is also a Paris-trained chef. He has been a featured presenter in multiple, global online symposiums featuring change-making influencers (scientists, shamans, mystics, psychologists, healers, and more), al L.R. Heartsong is “a healer who writes.” A bodyworker and counselor for more than twenty-five years, he fuses eco-depth psychology, soul-based coaching, shamanic work, and spiritual guidance. He is also a Paris-trained chef. He has been a featured presenter in multiple, global online symposiums featuring change-making influencers (scientists, shamans, mystics, psychologists, healers, and more), all stitching us to a deeper connection with self, healing, and the 'more-than-human' world. Other interviews with him include the award-winning Conversations Radio with Michael Stone, who speaks with thought leaders and social visionaries in areas of environmental restoration, evolutionary cosmology, social justice, and spiritual fulfillment. Currently he writes TendingSacred, a monthly exploration of a healer’s path, and hosts the newly launched Embodied Soul Podcast. He is working on a memoir of this reluctant mystic's time living in England.